The platform introduces two new analysis environments: AIM and Electronics Desktop. ANSYS 16.0 delivers capabilities that can help engineers verify electronics reliability and performance throughout the design process and complex electronics industry supply chains. Image courtesy of ANSYS Inc.
ANSYS Inc. has released version 16.0 of its ANSYS engineering solutions for structural, fluid, electronics, systems engineering and analysis. Version 16.0 incorporates new features and enhancements across the entire ANSYS product portfolio, enabling engineers to validate complete virtual prototypes, according to the company. This ANSYS image depicts a full automobile UTM (underhood thermal management) simulation showing resultant surface temperatures. Image courtesy of ANSYS Inc.
Major features in version 16.0, reports ANSYS, include verification tools for connected electronic devices, simulation capabilities for the “entire spectrum” of structural materials, streamlined fluid dynamics simulation as well as extended modeling capabilities for model-based systems and embedded software development. ANSYS 16.0 also marks the debut of ANSYS AIM, a unified multiphysics environment, and ANSYS Electronics Desktop, a working environment tailored for electronics simulation. ANSYS AIM is a single-window 3D simulation environment for multiphysics simulations that span all ANSYS physics capabilities, including structures, fluids, thermal properties and electromagnetics. AIM simulation, says the company, uses proven ANSYS physics technologies packaged in a new environment that is both intuitive and accessible to the entire engineering organization. Based on the ANSYS Workbench platform, AIM’s open architecture can be configured to automate best practices and create specialized applications. ANSYS 16.0, says the company, delivers capabilities to verify electronics reliability and performance throughout the design process and electronics supply chains. The ANSYS Electronics Desktop represents one of these capabilities. A single-window, integrated interface, ANSYS Electronics Desktop brings electromagnetic, circuit and systems analysis into a seamless working environment that ANSYS says can maximize productivity and ensure that users follow simulation best practices. The new ANSYS Electronics Desktop interface introduced in ANSYS 16.0 enables users of ANSYS HFSS software for simulating full-wave electromagnetic fields to define and create 3D simulation components for reuse as well as for sharing with partners. Image courtesy of ANSYS Inc. 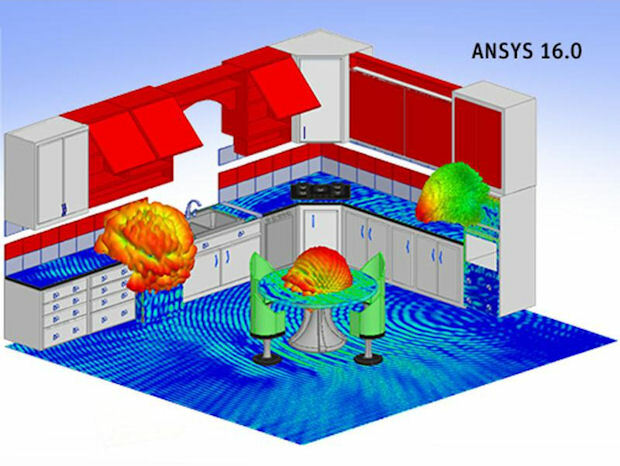 The ANSYS Electronics Desktop features ANSYS HFSS software for simulating 3D full-wave electromagnetic fields and what the company says is the industry’s first 3D EM (electromagnetic) component library. The 3D EM library, which both engineers and CAD support teams can use, can be coupled with IP (intellectual property) protecting encryption to share HFSS components between design teams and across high-frequency supply chains to expedite communication system integration. Users can also create 3D components and then integrate them into larger electronic assemblies. Simulation-ready 3D components stored in library files can be added to larger system designs without requiring the user to apply excitations, boundary conditions and material properties. For simulating structural materials, ANSYS 16.0 offers new and enhanced capabilities for composites and thin materials, such as sheet metal and elastomers like rubber. For composite materials, ANSYS 16.0 provides new functionality for composite designs as well as tools for better understanding simulation results. For modeling structures made with sheet metal and plate steel, ANSYS 16.0 offers a set of tools for handling workflows that manage the large number of bodies in an assembly, and it allows users to create a meshed model in an automated way. ANSYS 16.0 also provides advanced solutions for elastomers such as adaptive remeshing, which refines the mesh in highly distorted areas without requiring users to stop the simulation manually. ANSYS 16.0 also sees updated capabilities for contact simulation between multiple parts as well as improved solver performance. ANSYS says that version 16.0 reduces fluid dynamics simulation time for complex models by as much as 40%. Design optimization time has been reduced through a new adjoint designer tool that enables engineers to perform multi-objective shape optimization, including constraints. Engineers can now use the adjoint solver to model up to 50 million cells. ANSYS 16.0 introduces ANSYS AIM, a single-window 3D simulation environment for multiphysics simulations that span all ANSYS physics capabilities. An FSI (fluid-structure interaction) simulation of a flow control valve is pictured. Image courtesy of ANSYS Inc.
ANSYS 16.0 has enhanced capabilities for developers of systems and embedded software. Among these features are extended modeling capabilities that enable hardware and software engineers to define the intricacies of a system and its subsystems operations, says ANSYS. The addition of behavioral diagram modeling is included among these enhancements. ANSYS 16.0 also provides a model-based approach that satisfies the requirements of DO-330, the tools qualification document within DO-178C, Software Considerations in Airborne Systems and Equipment Certification requirements. 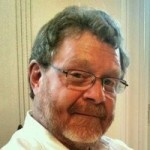 ANSYS says that version 16.0 is the first tool to meet that new certification requirement. In addition to its new capabilities and enhancements, ANSYS reports that version 16.0 delivers improved solver performance to provide users with a faster time to solution. Of interest to Windows users in HPC (high-performance computing) environments, ANSYS 16.0 is said to take full advantage of Intel Xeon processors and Intel Xeon Phi co-processors. For further details on the ANSYS 16.0, visit ANSYS. Watch a video to see how smart shape optimization is possible with ANSYS adjoint solver. Watch a video to see how to deal with hyperelastic materials such as rubbers. Register for a live or on-demand ANSYS 16.0 update webinar. 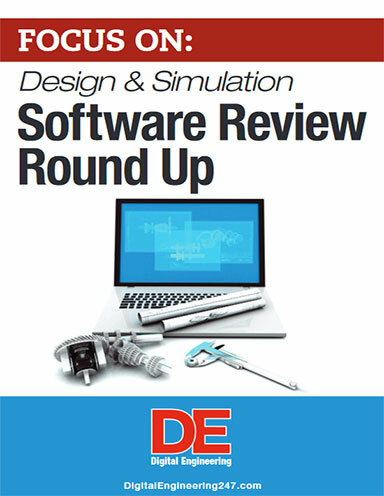 See why DE’s Editors selected ANSYS 16.0 as their Pick of the Week.